The overall goals and objectives of the Expo are to promote, stimulate and provide avenues for sustainability to existing and potential Molokai businesses. The event is intended to offer exposure and partnerships with a multitude of businesses, to include but not limited to farmers, financial institutions, internet service providers and food service establishments. The event would offer a venue for farmers that are “value added” entrepreneurs to display and test their products for marketing opportunities. The event would also provide a variety of businesses; crafters, artisans, and manufacturers a business venue to market and sell their local products. In addition, the Chamber sees this as a means to increase visitor count during a slow travel period and to promote the Chamber’s mission and increase the membership. The greatest benefit of this event is the ability to foster well-managed economic growth without compromising the cultural values and unique life style that make Molokai so special. Invitations to participate in this event are open to all Maui County businesses and selected food establishments. 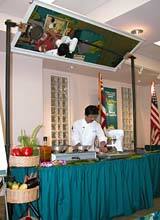 Selected Maui County Chefs are invited to dish up unique receipts using Molokai products. Each Chef is matched to a product grown on Molokai. We encourage consumers and restaurant buyers to purchase Molokai produce and products from Molokai farmers and wholesalers. By linking this partnership, the food segment of the event gives each the opportunity to create a beneficial economic exchange and give Molokai businesses the chance to feature their products where it would have not otherwise been possible. Prior to the Expo, Molokai Chamber, Molokai Community Service Council, Queen Liliuokalani Children’s Center, and Molokai Rural Development Project in partnership, sponsored a number of workshops in response to farmers interested in food manufacturing which included packaging, labeling, sanitation and production process. Workshops and coaching support were geared to ready these “value added” entrepreneurs for potential marketing opportunities at the upcoming Business & Food Expo. Ensuring maximum participation and exposure with limited expense to participants is the driving force behind the event. With the knowledge of Molokai’s success in events that offered a “family day” of entertainment, food, products and information, we believe that the Expo is the perfect annual fundraising event for the Chamber. After securing financial support from the County of Maui Office of Economic Development and sponsorships from American Savings Bank, Maui Electric Company, Young Brothers Ltd., Bank of Hawaii and Meadow Gold Dairies, advertisements were placed in local newspapers and radio stations throughout Maui County. This method of advertising was estimated to reach over 20,000 households within the County of Maui. In addition, all major restaurants have been contacted and if interested, linked with farmers and wholesalers on Molokai. The event also offers booths at reasonable cost to business owners and affords them the opportunity to feature products and services to a large number of people without the travel and shipping expenses. The event also offers maximum media coverage by the appearances of three participants on both KITV and KHON morning news. 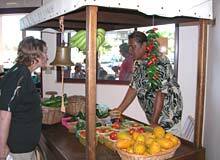 The Molokai Chamber’s website features the vendor application. Media coverage – the Chamber receives numerous phone calls for additional information, transportation and booth fees. Attendance is estimated to be 800-1,000 people during the hours of 9:00 a.m. to 3:00 p.m. Up to 7 chefs participate in the food demonstration. Approximately 2,500 scripts are sold during the day. 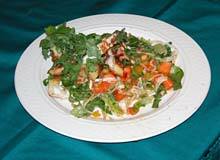 These are sold to purchase the chefs samples at a cost of $1.00 to $2.00 per dish. A variety of shrimp, sweet potatoes, vegetables, fish and meat products donated by farmers and merchants are cooked and artfully displayed. 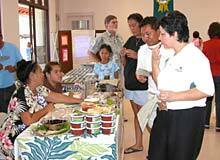 Molokai High & Intermediate School students volunteer to collect food scripts and assist the chefs in arranging the food samples for sale. The teachers in charge of these students report that the students gain invaluable experiences from the Expo and it exceeds their expectations in the food culinary business. 25-35 vendors offer a variety of products and services. The value added food producers are usually swamped with future orders; a food vendor was offered a job as a pastry chef by one of the participating hotel chefs. Craft vendors take in higher sales than their normal average Saturday’s sidewalk sale. The Chamber will continue the Expo workshops that facilitate these businesses to the next level. Workshops will be geared to improving their product to be competitive, unique, establishing a market niche, and marketing strategies. Our Annual Expo takes place in late October or early November at Lanikeha Community Center. 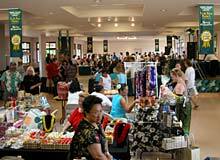 At this event, the Chamber and its sponsors hope to create an even bigger awareness of Molokai’s unique products and feature entrepreneurs that have come forward with interest to showcase their goods at this event. And with the continued support from Maui County Office of Economic Development and great sponsors that have stepped forward to support our efforts, we hope to raise the bar for Molokai’s businesses sustainability.